Home > What is Inmetro? Inmetro is short for Instituto Nacional de Metrologia, Normalização e Qualidade Industrial, which is the National Institute of Metrology, Standardization and Industrial Quality. In the scope of its mission, INMETRO aims to fortify national companies, increasing their productivity by adopting mechanisms destined to the improvement of the quality of products and services. Being so, INMETRO mission incorporates the promotion of the quality of life of the Brazilian citizens and the competitiveness of the Brazilian economy. Which products require a certificate? You can refer to the INMETRO page to view a more detailed list of those products. 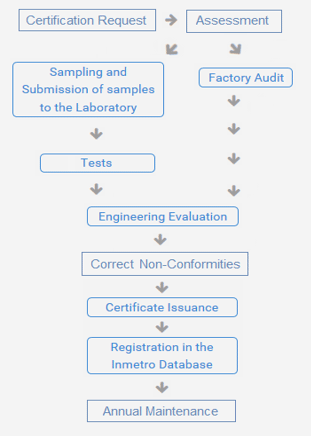 Are granted to companies that decide by themselves that they want to have their goods or services certified by Inmetro. The decision to voluntarily apply for an Inmetro certification is usually made by Brazilian exporters to comply with international requirements. For example, the United States and the European Union demand that, for most products, a certificate stating that the product or service meets the requirements imposed by Inmetro. Are imposed by specific regulations issued by Inmetro that define the minimum requirements that need to be met by companies producing specific goods, stating that a company can only commercialize or produce a product if it has already been duly certified. Compulsory Certifications are generally demanded in cases where products or services may present harm to a person’s health, security or to the environment. Inmetro regulations are also imposed on imported goods. In this case, the product must be certified by a foreign regulatory agency that is acknowledged by Inmetro. In cases where products or services have already been certified by a regulatory agency acknowledged by Inmetro, the importer needs to submit their Import License to Inmetro, as well as the goods conformity certificate to one of the entities accredited by Inmetro in Brazil. For all products that are subject to Compulsory Certification by Inmetro, a special license is needed in order to import them and a Declaração de Liberação para Importação de Produtos, Portuguese for Declaration of Release for Import of Products, is to be requested from Inmetro. – Strengthening and credibility of the brand, demonstrating ethics and respect for the consumer. – Consumer protection, guarantee that the product attend the minimum quality requirements and that the user is not exposed to risk conditions. – Protection of the brand, guaranteeing that the brand will be protected under the law, and its products have been duly tested, certified and approved by the competent bodies. In a scenario of increasingly informed and demanding consumers, surely this set of values gives your product an important differential.